Creating a successful video membership site requires a clear understanding of what the customer’s needs are and how these needs can be fulfilled in the most expedient and easy-to-use manner. Take a look at how our team was able to develop a brand new website by pinpointing these key features in order to enhance the user experience for subscribers while considering conversion rate and customer retention for our client. 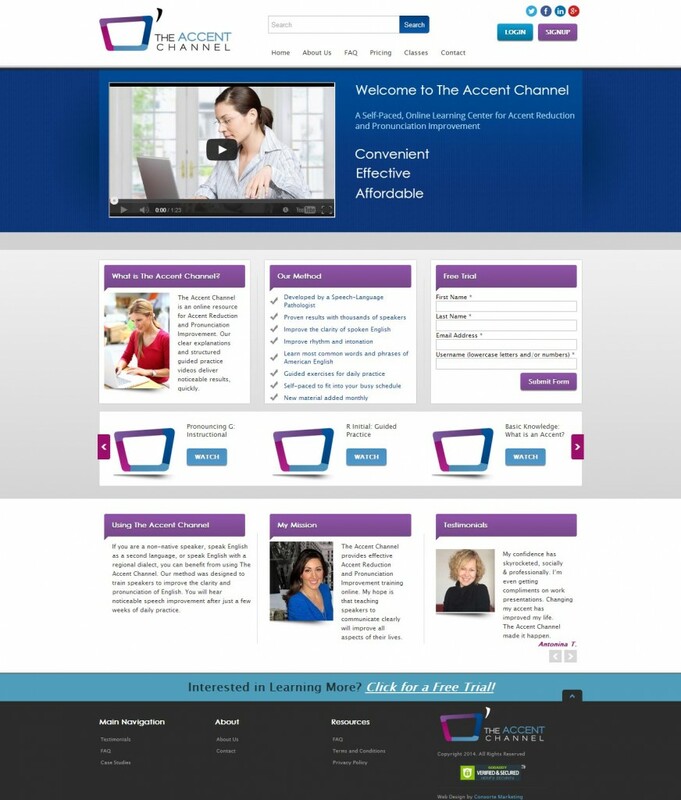 The Accent Channel is a video membership website for people who want to reduce their accent and sound more American. It features hundreds of well-organized video tutorials and is the brainchild of Jessica Kijowski, an expert in accent reduction and pronunciation improvement. Jessica’s clients range from Hollywood actors to high profile business executives. To make this online business run beautifully, we’ve taken a number of important steps. Slow load time. Media-heavy websites like this one can fall into the trap of loading ata snail’s pace, which will drive away customers. Nowadays, few people have the patience for a page that takes 10 seconds to load or a video that takes 30 seconds to buffer—not when competing sites move more quickly. Membership and payment functions. This site needed to incorporate variety of membership levels appropriate for various users’ needs, including a free trial, and it required a convenient and well-conceived subscription payment system. Media security. Part of the value of this site is in its educational videos, which necessitates tight site security. It’s important to prevent a tech-savvy user from viewing the site’s source code, copying the URL of all available videos, and downloading them directly to a computer. This person could then cancel the membership and leak (or sell) the videos to other users. Lessons for customers on the move. In this day and age, it’s rare that a user has the time and inclination to sit in front of a computer for all lessons. To remain competitive, sites like this must offer an on-the-go mobile experience for smartphone and tablet users. Cloud video streaming. The site’s videos are hosted in Amazon Simple Storage Service (S3) via Amazon Web Services (AWS). Using a content distribution network (CDN) ensures that intensive tasks like video streaming do not eat up the site’s valuable resources, as they are hosted elsewhere. In addition, a cloud-based configuration like this one allows for the use of more resources when traffic is at its highest points. Multiple membership levels and easy payment. We used an advanced membership plugin to design and launch three subscription levels for users, each with access to certain site pages. This allows the website administrator to add and remove accessible content for each level with ease, e.g. an advanced tutorial available only to the highest-paying members. Additionally, we synced the website with a PayPal business account for easy monthly payments and a simple cancellation process for subscribers. Tight video security. As we mentioned, videos are hosted in Amazon’s cloud-based S3 storage. They’re then run through Amazon Elastic Transcoder and Cloudfront and streamed onsite. Using Cloudfront ensures videos are well protected, as the URL is generated with tokens. It’s useless to a viewer who is attempting to circumvent the membership system. Responsive design for on-the-go studies. We designed the website to load optimized versions for the devices used to access it, so that customers using their smartphones and tablets can study anywhere, so long as they have an internet connection. By implementing these vital development options, we’ve helped The Accent Channel to ensure high levels of customer satisfaction, speedy subscription payment, and protection of proprietary materials—all very important aspects of running any successful online business. What can we do for yours?